Beauty Professor: Dolce and Gabbana Luminous Foundation Swatches! That looks great!! Wanna get my hands on that!! I was looking forward to the review on this foundation. Are you going to do the full review on this one? :) Is this good for oily/combination skin? I am hoping to do a full review in the next week or two...thanks for your interest...from my nominal experience with this foundation thus far, it is indeed lighter in texture than the creme version (which I own) and therefore feels like it might be friendlier to combination skin. Have a wonderfully blessed Christmas! Thank you for stopping by, Chris El!! I will be doing a full review soon...the D & G line has yet to disappoint me! I am working on the review...up soon (along with the D&G Perfect Finish foundation)! Thanks for watching my video...happy to hear that we are of like mind with this; truly, this foundation has completely surprised me with its finish and performance...insane! Many colors to choose from! love it! Thank you, Lee, for stopping by!! I'm interested in this foundation by Dolce & Gabbana. In MAC I'm a NW 35 and what to know if the Amber one would worked for me. my undertone is warm with golden if thats helpful. I am thinking that Bronze #144 might be a better match for you...I would be concerned that Amber could oxidize to be too dark. I will be posting some swatches of the D and G cream foundation very soon (very similar color lineup)...that might shed some additional light on your best match! Thank you so much for posting these!! I wanted so badly to order this foundation (the closest D&G counter is 8 hours from me) and all the swatches on merchant websites were sooooo bad! Thank you again, because I was about to make a huge mistake and go WAY too light! We have no Sephora nearby either so I was so sad! LoL! Awesome swatches, you're the best! So glad to hear that my swatches were helpful for you! Ordering online can be so daunting without seeing some true to life images of the product (especially when that product is foundation!). I hope you love what you ordered...please keep me posted and have a lovely week. 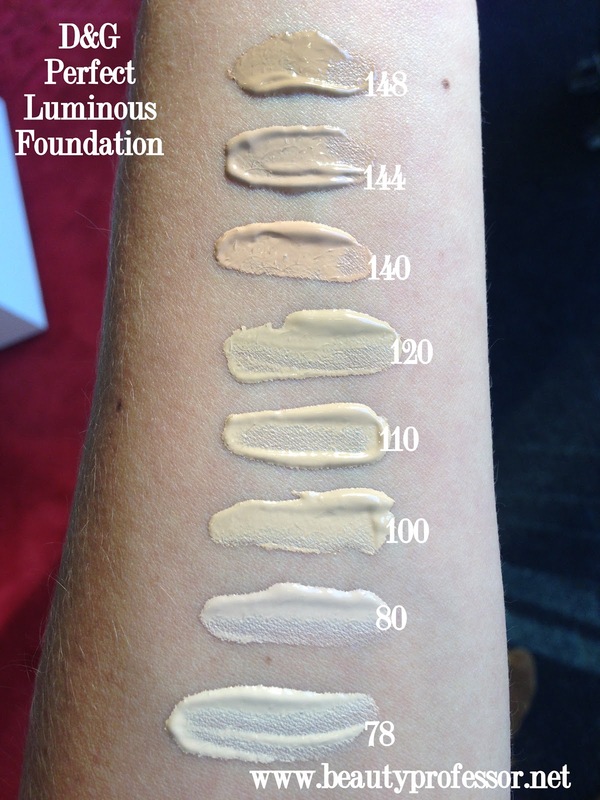 what did the colours look like to you when you bought this foundation? i cant see for myself as no where near me sells this so i would have to buy online.. I hope this information is helpful...keep me posted on what you decide and do take care! i cant find a store that sells it. My pleasure...I hope the shade you choose is absolutely perfect for you!! I currently use YSL Teint Resist foundation in 7 (pink beige) in the winter & 9 (honey) in the summer and I mix them the rest of the year. 7 is the perfect match to my skin but I use tanner a lot because I hate being pale so it is too light for the warmer months. If you are familiar with those YSL foundation shades what would you recommend as equivalents in the D&G matte foundation? Rose beige maybe? Thanks for your comment! I am so glad you found your way here : ) I have such an obsession with foundation, that I aim to swatch as much as I can for my readers. I don't yet own the D&G Matte foundation, but will review it as soon as I pick it up or get a sample. Based on your current shade matches in YSL and my experience with D&G, Rose Beige would definitely be your best match in this line. Thank you sooooo much - I ordered it in the rose beige like you suggested and it is a perfect match to my skin! Now I just need a darker color for summer when I tan - I was thinking "warm rose" but I would love to hear your suggestion! I believe it comes in a "bronze" and "tan" color as well but I'm not sure if those are too yellow for my skin tone. When I looked on the Sax website the color of rose beige looks darker then warm rose so it's very confusing. What I want is just a shade or two darker then rose beige in the same tone but bronzier or tanner if that makes sense :-) Thanks again - you are the best! Hello Jennifer...my pleasure! I am so glad that my color suggestion was a match for you!! Warm Rose is actually a shade lighter than Rose Beige so I don't think it will be your perfect summer shade. Bronze, however, is a neutral to rosy tan shade that is one step up from Rose Beige...that would be what I would choose! Thanks so much and happy to help! 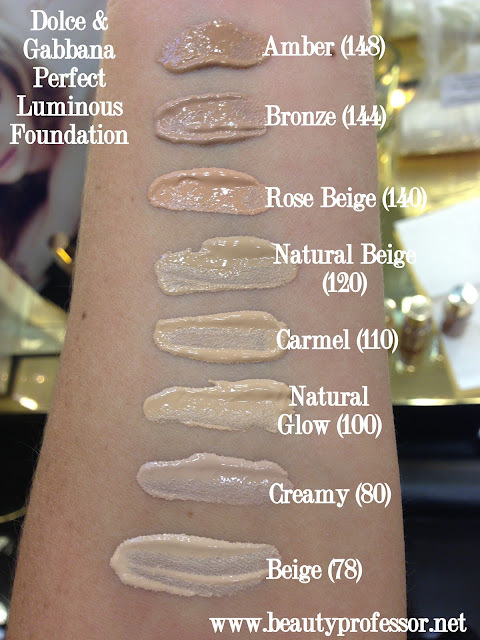 I would recommend the Bronze shade for you based on your current foundation matches. Thank u sooo much for your reply..100% excitement at the moment !!! I thought bronze would be the right shade however a month ago i bought some D&G foundations online. Im from australia and it was so hard to find the right shade without seeing it in person. I took my chances and bought the creamy foundation and the powder in caramel and perfect matte foundation in natural beige. They looked slightly light on my face...but the texture of foundation! My oh my...luvvvvvve it!...especially the matte foundation thats why this time id like to research before i buy the product...sillly me..i have been in your blog reading your reviews but never had the guts to ask u questions. Anyhow...i love the matte foundation it doesnt feel like u have it on your face! Im so amaze! I was wondering with the natural beige shade..i use medium dark mineral skin finish by MAC to set it..and i get good feedback from it...so if i get bronze..would that be a tad dark on my face?...or should i use a lighter shade of powder to set it? Sorry i have too many questions...i am addicted to make ups...i target high end make ups now...geez i cant get enough of it! Which is better the perfect matte or the luminous in D&G? Im soo happy i found your blog....OMG I sound creepy now...sorry...im just excuted...thank u once again! Keep blogging!!!! You are welcome! If Natural Beige is a good match for you in the Matte, then I am guessing it should be OK for you in this formula as well (it is a little sheerer so it should seamlessly blend). I'd hate for you to get the Bronze and have it be too dark! I'm so excited to find that you reviewed this foundation. I recently fell in love with Kanebo Sensai CP thanks to you, but am always on the hunt for something different to widen my options. I've been looking into the D&G luminous foundation, and was wondering what you thought about the wear time about this foundation? 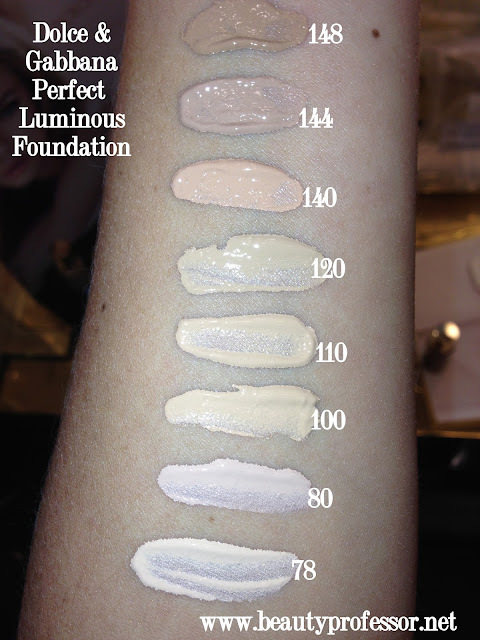 And how does the wear time compare to other luminous foundations like Kanebo Sensai and GA luminous? Thanks!! Thanks for your comment...I am glad you found the treasure that is the Kanebo Sensai CP...it's divine! I've only tried this particular D&G formula in sample form and found that the coverage is slightly lighter than that of the KS but more than the GA Luminous. Wear time is average overall, but I think it might wear a bit better than the GA Luminous but not as well as the KS Sensai, at least in my experience. I have been trying to figure out which shade to get in this foundation for months. I do not have a Dolce & Gabbana counter anywhere near me, so I will have to order online. I am typically an NC43 in MAC Foundations and a 040 in DiorSkin Forever Flawless Perfection Liquid Foundation. Would you be kind enough to let me know which shade you recommend for me please? I would suggest the Bronze 144 as a similar match to the Dior 040! hello....i use nars punjab,mac studio fix c4 ,urban decay naked 4, chanel aqua vitalimier b30-b40 ....what shade should i choose ? thank you !!!! I would suggest Caramel or Natural Beige! I would suggest Natural Glow #100! Thank you for posting swatches. Extremely helpful since I would have to order online without trying it first. I am MAC NC20, Dior 021, Nars deuvile, Lancome teint miracle buff 6w... do you think 100 would be a good match? Thanks for your kind words...yes, shade #100 is a great match for the other shades you wear! I would suggest #120...to me, it is closest to NC 30!